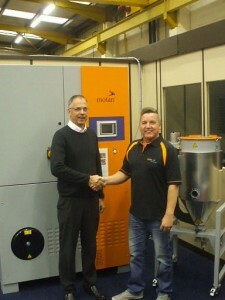 Motan Colortronic is pleased to announce that Engineer Les Jordan has rejoined our field service and engineering team. “Les beings with him extensive engineering experience and expertise and we are delighted to welcome him back” states Karl Miller, Managing Director. His appointment enhances our existing team of professional engineering personnel who are located country wide, demonstrating our ongoing commitment to our customers. In addition, our comprehensive stock of over £1 Million of equipment and spares at our centrally located Chesterfield site ensures our Engineers can respond rapidly and efficiently to any customer requirement. 2014 will be our 40th year in business and we would like to thank everyone for the support they have given over this time.